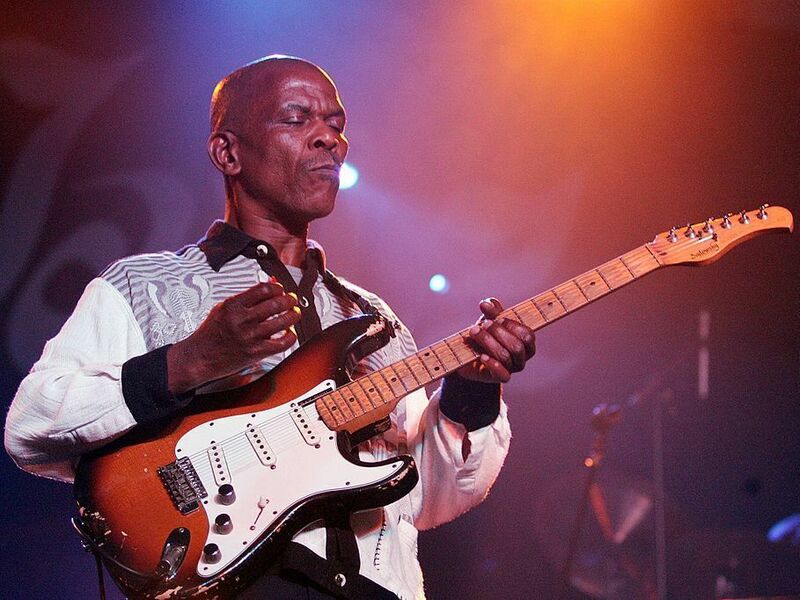 'Graceland' Guitarist And Arranger Ray Phiri Dies, Age 70 : The Record The South African guitarist and vocalist was best known in the U.S. for his collaboration with Paul Simon on the iconic album Graceland -- but at home, he was a jazz fusion star. Guitarist Ray Phiri on stage with his band Stimela in Johannesburg, South Africa, in 2007. One of South Africa's top musicians — and an artist whose sound was known the world over, thanks to Paul Simon's album Graceland — has died. Guitarist, vocalist and composer Ray Chikapa Phiri was 70 years old. He had been battling lung cancer, and died early this morning in a hospital in the northeastern city of Nelspruit. His death was announced by a family spokesperson, Paul Nkanyane. Internationally, Phiri was known primarily for his contributions to Paul Simon's Graceland album and ensuing tours; it was his guitar and arrangements that helped define the distinctly South African sound of the project. But at home, Phiri was also celebrated as the co-founder of the influential group Stimela, a popular fusion band that melded smooth jazz with mbaqanga: an energetic, rhythm-heavy genre that itself married local styles with jazz. Although Graceland became famous around the world, it was an endeavor that came under heavy criticism at the time of its release, both in South Africa and internationally. Recorded in 1985 and released the following year, Graceland was put together amidst the UN-approved boycotts of the apartheid state, a position which had also been endorsed by Artists United Against Apartheid, an influential group founded by guitarist Steven van Zandt and whose ranks included the likes of Bob Dylan, Peter Gabriel, Bruce Springsteen and George Clinton. (Its members recorded the anti-apartheid song "Sun City.") The recording project was also not sanctioned by the African National Congress (ANC). But Phiri had a different perspective. In a 2012 documentary about the making of Graceland titled Under African Skies, Phiri explained his decision to participate in the collaboration. "Here I was, living in South Africa," Phiri said, "and then here comes a particular individual called Paul Simon. For me, music is the closest thing to religion. And if it's utilized in the right way, it can inform and bring people closer, and they can find solutions to their problems. And Graceland did that." "Ray Phiri was a voice for the voiceless and a legend of our time. An immensely gifted composer, vocalist and guitarist, he breathed consciousness and agitated thoughts of freedom through his music ... He has played his role in unearthing and support new talent in the industry and has been an ardent and vocal advocate of the call for greater investment in local content development and the development of the industry as a whole." One of Stimela's most famous songs was the protest track "Whispers In The Deep." With lyrics like "We're all tributaries of the great river of pain," it became an anthemic cry in 1980's South Africa.